A traditional food item among some ethnic communities in the northeastern region, rat meat is sold at the same price as broiler chicken at Rs 200 per kg. A traditional food item among some ethnic communities in the northeastern region, rat meat is sold at the same price as broiler chicken at Rs 200 per kg, the sellers said. Buyers throng the Sunday market at Kumarikata village, along the Indo-Bhutan border, about 90 km from Guwahati, to buy their favourite meat of freshly trapped rat. Rat is more popular than chicken and pork with the customers at the Sunday market. A rat vendor said that the meat is mainly sourced from neighbouring Nalbari and Barpeta districts of Assam. Local farmers hunt the rats, weighing more than a kg each, at night during the harvesting season with traps made of bamboo, to prevent their fields from being damaged by the rodents that eat paddy and other crops. The farmers claimed that the trapping of the rats was helping them to curb the growing menace of rodents in recent times. Explaining the method of trapping the rats, a seller said the rodents are hunted at night when they come out of their holes and walk straight into the traps placed by the farmers at the entrance of the rat-holes. 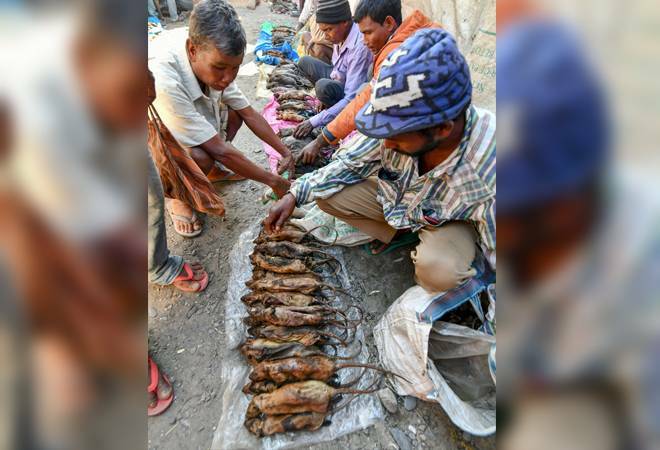 Rat meat is usually sold by the economically challenged people of the Adivasi community to augment their income earned from working in tea gardens, where plucking of tea leaves reduces during the winter season, the sellers said. "Business is good as we can trap rats weighing 10kg to 20kg a night for selling it in the market," they said.